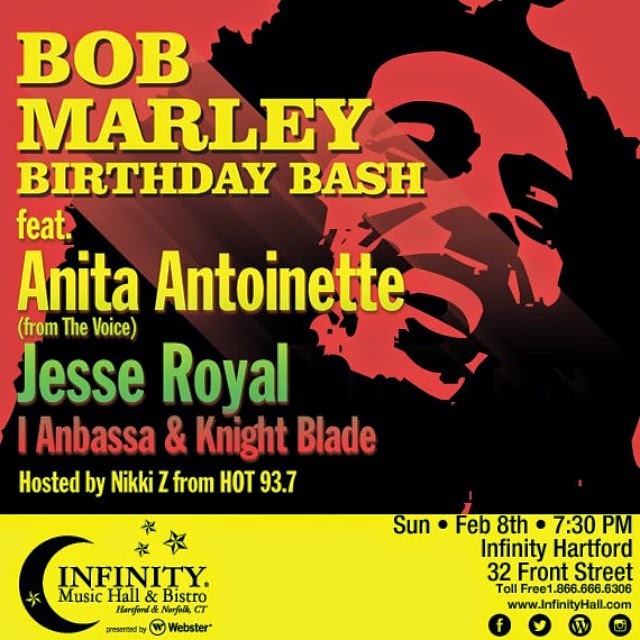 A Night of many first in Connecticut, as prestigious Infinity Hall hosts it's 1st Reggae event where acclaimed reggae sensation Jesse Royals will give his first performance in the state, and NBC's The Voice Anita Antoinette's will also give her first official performance since performing on the top rated show. Infinity Hall is excited to announce the first annual Bob Marley Birthday Bash in honor of Bob’s Birthday and the musical legacy he left to us all. The line-up features Kingston’s own Anita Antoinette and Jesse Royal plus I Anbassa (Bridgeport, CT) and The Kings Suns. This special event is hosted by everyone’s favorite Caribbean queen of the air waves, Nikki Z from Hot 93.7. An excited Nikki Z revealed "Anita is a CT resident, she attended school here and after her amazing journey on the voice it was only right to present her on this show. Jesse Royal is one I am thankful we were able to get, he reminds me so much of a young Peter Tosh. His style and energy will ignite the venue with positive vibes, reggae vibes along with his band "The Kings Suns". I am very excited to see his performance. We also have award winning Band I Anbassa from Bridgeport CT who I have worked with many times and they never disappoint." "Infinity Hall reached out to me because they wanted to expand their reach into the community, bring more events that everyone can love. We knew celebrating the man who spearheaded the "One Love" movement was the only place to start." stated media personality Nikki Z. Anita Antoinette is fresh off the competition trail of NBC’s The Voice, this will be her first concert appearance following the television show. Anita creates insightful, passionate melodies that combine the soulfulness of her Jamaican roots with a profound understanding of the world we inhabit. Another Kingston transplant, Jesse Royal Jamaica's New Roots Star will be appearing in Hartford for the first time! Having recently released his third official mixtape in collaboration with Major Lazer dubbed 'Royally Speaking' to critical acclaim this artist is emerging as a reggae’s hottest ambassador. Joining them are the fun loving high energy group I Anbassa, CT Music Award winners for best reggae band three years in a row. Nikki Z is also working closely with the Rockhouse Foundation to help raise school supplies and donations to help build more school in Jamaica. On Feb 8th they request patrons donate school supplies to be all sent to Rockhouse Foundation schools. "We are also giving back to our young Jamaican brothers and sisters by collecting donated school supplies for The Rockhouse Foundation. Rockhouse is a non-profit organization that has raised and invested over $2 million to transform and modernize schools in Jamaica."